CAREER HIGHLIGHTS Swash joined GKN in 2007 as CEO of the British engineering firm's aerospace division after 27 years working for aircraft manufacturers such as Airbus. 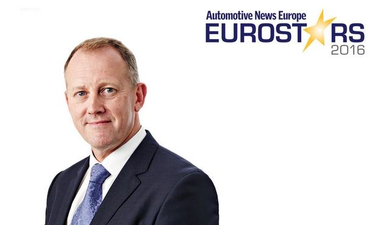 In 2014 he moved to CEO of GKN's machinery division, before being promoted to CEO of the company's automotive division, GKN Driveline, a year later. REASON FOR WINNING: Swash has overseen the continued expansion of GKN Driveline's driveshaft business into more valuable all-wheel-drive components. Sales of awd technology such as the company's fuel-saving disconnect system used by the Jeep Renegade and Fiat 500X SUVs now account for more than half of the division's dominant constant-velocity joint business. Combined with the future-leaning e-axles and eDrive systems for electric and hybrid cars, awd revenue has grown to 1.4 billion pounds ($1.8 billion) last year from 1.2 billion pounds in 2012.